Wolf and Bear uniforms are the same except for the hat, neckerchief and slide. Any Rank Advancement Badge, Patches, Belt Loops, or Pins that your boy earns throughout the year will be awarded (at no cost) during the Monthly Pack Meetings. 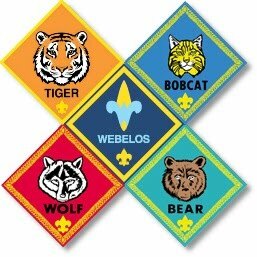 **EFFECTIVE June 2015--The Cub Scout Program will no longer use the "Progress Toward Ranks" and beads as part of advancement recognition. Instead, Adventure Loops will be earned and worn on the uniform belt to signify advancement through the ranks. Arrow points will also no longer be used to show elective completion, as these will also be represented by the Adventure Loops.